Here is the menu for this weekend's dinner party. Of course I might change things up should I spot a winner at the market. There's a few guests that have had some of my main creations like the Ankimo and lobster. To keep things interesting for them, I'm going to prepare them in slightly different formats. On the sushi portion, I do want to get more into the nigiri and one or two rolls just to demonstrate technique and bring some depth to the Japanese portion. The "Napa trip" scallops has no real name but it's a round molded chopped scallop course with tobbiko and avocado. I made this for Serena in Napa on a trip there and she requested it. The poached lobster is always a hit, and I wanted to make it more accessible by pairing it up with a nice mac and cheese. Black bean clams this time again, but with more of an emphasis on the vegetables to offer up a fresh crunch. Knife work on the bell peppers will be important. The dessert is what I will focus a lot of development on this week. It's a relatively technical dish and will take some practice runs this week. A paired dinner drink that we had in New Zealand may make it's way onto the menu too but we'll have to see as far as time/expense goes. 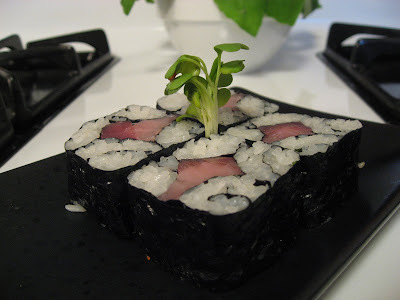 Food pic is a roll I made a few years ago.